Change a coin into ANYTHING. Then show your hands COMPLETELY EMPTY. 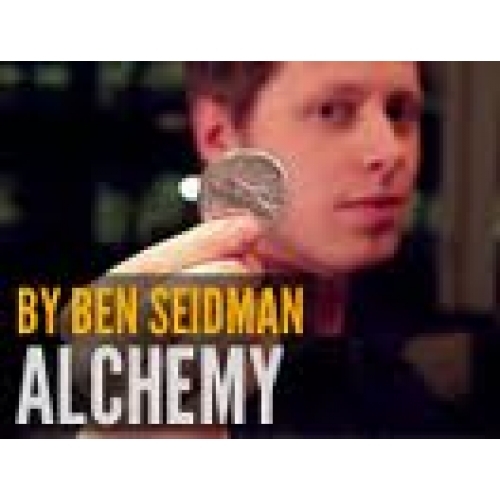 From the mind of magician Ben Seidman comes another wonderful piece of coin magic, allowing you to visually vanish a coin or change it into another object. Simple, direct, and powerful impromptu magic. ALCHEMY is performed with your sleeves rolled up, and looks like trick photography. Did we mention it is completely IMPROMPTU? NO gimmicks are used whatsoever. When was the last time you performed a trick that looked like real magic? If you're looking for something new and visual to add to your coin routines, or for a stand alone effect, ALCHEMY fits in perfectly. It will make your spectators believe they just saw real magic. You can turn a coin into virtually anything you please: a strawberry, key, or a different kind of coin. The sky is the limit with ALCHEMY. Use it to engineer your own original effects. Learn this beautiful piece of magic with 25 minutes of detailed instruction by professional magician Ben Seidman.